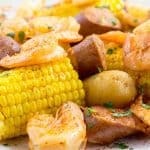 There is possibly no better way to use corn than in this Instant Pot shrimp boil. And the spice blend is like Old Bay and BBQ had a baby. Add all seasonings to a small bowl. Using a whisk (or fork), combine all spices – making sure to break up the brown sugar. Add chicken broth and 1 tablespoon of seasoning mix to pot. Next, add sausage, potatoes, and corn to pot and give a good mix. Lock lid and cook for 4 minutes at high pressure. Meanwhile – defrost shrimp (if frozen) in cold water, then drain completely. Once cook time is complete, quick-release pressure. Switch back to sauté setting. Add lemon juice, butter, and one more tablespoon of seasoning mix. Mix well, making sure that butter melts in liquid below. Finally, add shrimp and remaining seasoning mix, making sure shrimp are submerged in liquid. You may need to remove some corn, potatoes, and/or sausage in order to do this. Return lid to pot and let sit until shrimp are pink. This will take anywhere from 5 to 10 minutes. Then serve and enjoy!